Reiki One Class may be the upcoming event you’re looking for. Would you like to learn Reiki? Join us for a weekend of learning and healing and become attuned to the beautiful Reiki energies. Would you like to learn Reiki and unfold your healing gifts? Do you want to feel centred and bring a sense of peace and healing into every day? Over two days you receive four sacred Reiki attunements that gently open your energy bodies to the beautiful reiki energies. You will learn the history of Reiki and how to position your hands on the body to heal others and yourself. 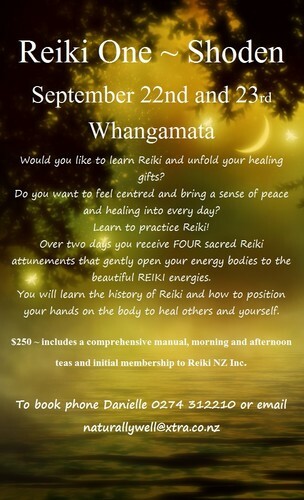 Cost includes a comprehensive manual, morning and afternoon teas and membership to Reiki NZ Inc for one year. To book phone Danielle - 0274 312210 or email - naturallywell@xtra.co.nz.